Six years after its founding in 2010, Meridian Senior Living was growing successfully and had become one of the largest providers nationally, but its executives found that its future direction was not clear. The solution: It split into two separate entities, Meridian Senior Living and Affinity Living Group. Now that Affinity is up and running and certain legal niceties have been completed, the new company’s leaders are opening up about why the separation happened and what the plan is for the future. The decision to split up the companies was rooted largely in the vision that Charlie Trefzger had for the Hickory, North Carolina-based company’s communities in the Southeast. 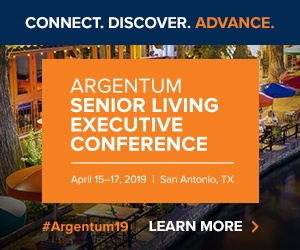 Trefzger, then the CEO of Meridian, wanted to position these properties for managed care, with a focus on the medicalization of assisted living for those who might not be able to afford high-end communities, he told Senior Housing News. This vision was not shared across the whole Meridian enterprise, which included communities nationwide. Affinity Living Group was already in the works when Trefzger approached Andrew Carle, an adjunct professor at George Mason University in the Department of Health Administration and Operations, where he teaches courses on senior housing management and operations. Carle was looking to get back into the industry, and Trefzger asked him to come on as chief operating officer for the new company. The split occurred in mid-2016 and was 60/40, with Affinity having the larger part of the pie, with its communities in the Southeast. Right now, the company operates in Virginia, the Carolinas, Georgia, Florida, Alabama and Mississippi. Currently, there is not an agreement between Affinity and Meridian that says either company will not develop or acquire properties in each others’ markets, but current plans are to grow the footprint in the Southeast, said Carle. Affinity has 88 communities and 6,700 beds overall, but by the end of 2018, there will be 12 new communities constructed as well as eight to 12 acquisitions, bringing the total up to 110 communities and approximately 8,000 beds in the next 18 months, according to Carle. Meridian still has properties nationwide. It is operating in 20 states from Massachusetts to California, with less of a medical and more of a hospitality focus. There are three areas that Affinity is focusing on to stay relevant and successful in the industry: employees, pricing strategies and greater participation in—and reimbursement from—managed care models. The staffing issues the health care industry is facing as a whole are nothing new, but Affinity’s strategy is more than just paying workers competitive wages. The company’s idea of “non-monetary currency” is just as important as wages, Carle said. “Everybody is talking about $15 per hour, but every study done for the last 40 years in business has shown that compensation is not usually more than fifth on the top ten things people want,” he explained. The company is paying on the high side of mid-level wages but then folds in the other non-monetary currencies. These currencies include appreciation and recognition, listening to each and every employee, maintaining open lines of communication, and an assistance program for employees, which is still in development. When it comes to rents, that is something that should be looked at industry-wide, said Carle. The affordable category may be the way to go, but Affinity is working on rebranding the term “affordable” to be “traditional” instead. Affinity’s goal is to offer all three levels of pricing: traditional, middle-market and premium. If successful, Affinity would be one of the first in the industry to truly serve the three distinct price points, Carle believes. Bundled care is the third way Affinity is planning to see success. The company is currently focused on becoming partners with managed care organizations, Trefzger explained. “Assisted living by itself is not able to be reimbursed but we are hopeful health care services that we provide will be able to be reimbursed,” he said. Affinity is currently looking into the potential for Medicare Advantage (MA) plans to pay directly for health care services in the assisted living setting. Though Affinity will make residents aware of the MA plans, they will not be required to enroll. To make itself attractive to managed care organizations, Affinity is using a system it customized with electronic health record company MatrixCare to capture outcome results and data. It has been collecting data through the system for the last two years and Affinity will soon be taking the data to partner organizations. One of the main goals of Affinity is to provide seniors who may not have saved enough money for retirement an opportunity to still be able to live in a great community, said Trefzger.